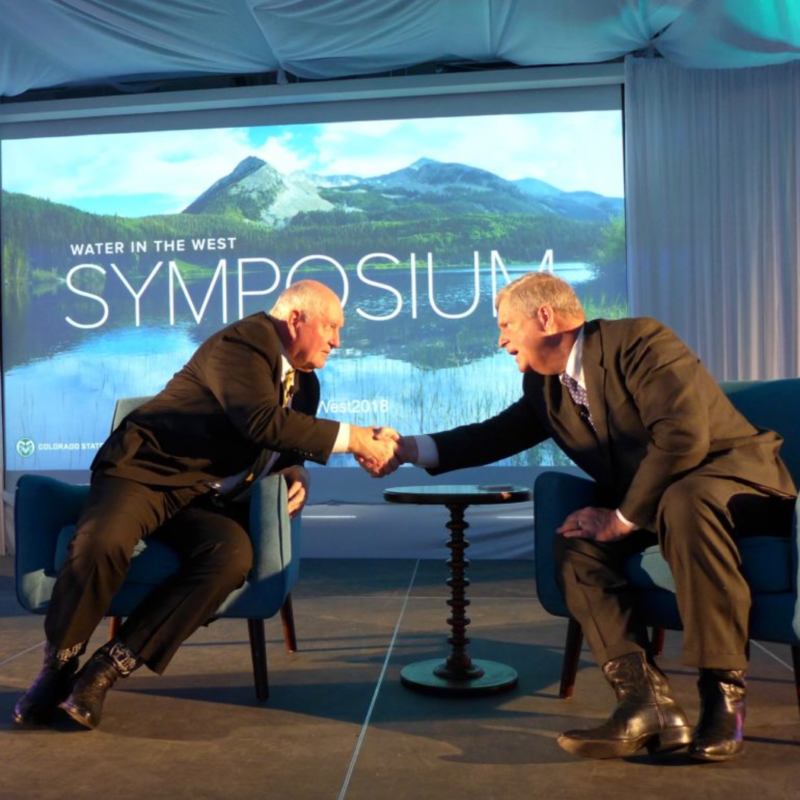 Some heavy hitters were invited by Colorado State University to speak at the inaugural Water in the West Symposium in Denver last week, including U.S. Secretary of Agriculture Sonny Perdue, the prior secretary of agriculture; Tom Vilsack of Iowa; U.S. Sen. Michael Bennett; and Gov. John Hickenlooper. But the two players likely to have the biggest long-term impact on water in the West -- climate change and drought -- were escorted to the event at the McNichols Civic Center Building in downtown Denver by Brad Udall, a senior water and climate research scientist at CSU who studies the Colorado River Basin. 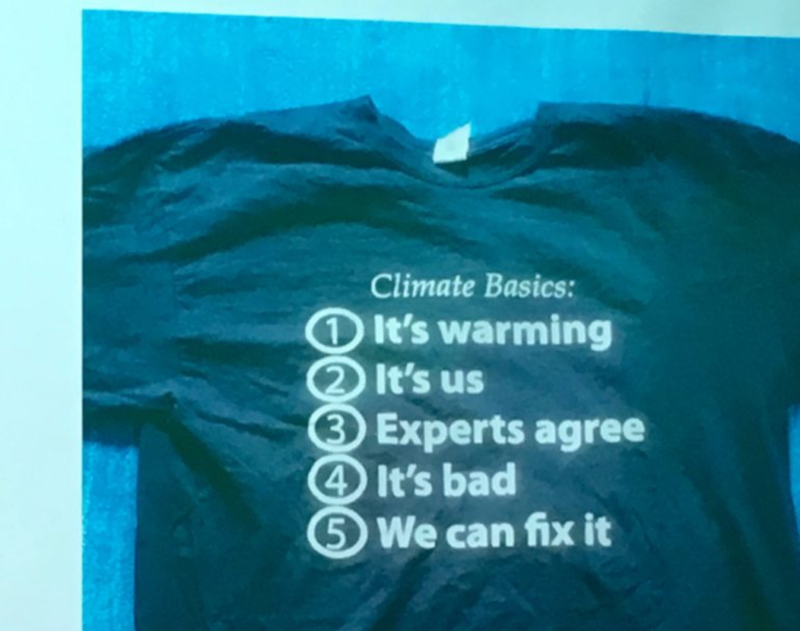 Udall's version of climate change came wearing a T-shirt Udall designed with five "climate basics" listed on it: "It's warming; It's us; Experts agree; It's bad; We can fix it." "The outlook is for a much drier Colorado" Udall told an audience of about 400 people on Thursday, which means less water and more fires in the state. And he noted, "climate change is water change." Colorado State is preparing to build a new water center in partnership with Denver Waver on the National Western Center campus that's being developed on the site of the long-running stock show in Denver. And the symposium was a way of illustrating how one aspect of the new water center will function by bringing people together to talk about water policy and science. The current 18-year-drought in the Colorado River Basin now has a name: the "Millennium Drought," and it's got Udall spooked. "Something very odd and unusual is going on here," Udall told the symposium crowd. He said the period from 2000 to 2017 "is the worst drought in the gauged record" of the Colorado River and that flows have declined an average of 20 percent a year since the turn of the century due to rising temperatures. 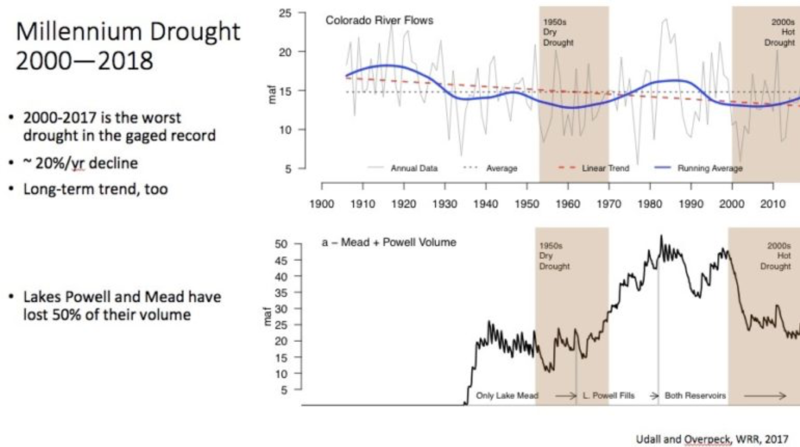 It's also time, Udall said, to consider that "drought" is no longer an apt description for what Colorado is facing, which is really long-term "aridification." "'Drought' implies we're going to get out of it," Udall said. Perdue, who was governor of Georgia in 2007 during an extreme drought in that state, said Friday that he learned that drought brings out intense emotions in competing water users. "Drought is probably one of the most insidious, stressful occasions that I can think of," Perdue said, in large measures because "you have no idea when it is going to end." 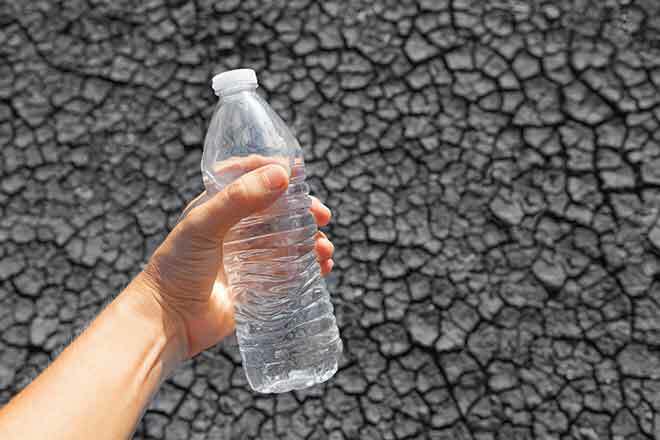 He acknowledged that water shortages in Georgia are rare compared to Colorado and the West. "We found ourselves with some of the issues that I know you all are wrestling with, and that is the things that happen between municipalities, agriculture, recreationalists, endangered species, and all those things," Perdue said. Perdue, a Republican in President Donald Trump's cabinet, was interviewed onstage by Vilsack, a Democrat who led the Department of Agriculture under President Barack Obama and is now working with CSU on food and water issues. The exchange between the two was civil, given the current political climate, and it ended with the two of them reaching out to warmly shake hands and look each other in the eye. Perdue had also been praised earlier in the day by Sen. Bennett, a Democrat, for Perdue's help in passing a bill to restore operational funds to the U.S. Forest Service that had been eaten up by the cost of fighting major fires in the West. Bennett said he'd been working on the issue for nine years and considered both Perdue and Vilsack, for his earlier help on the issue, "heroes of Colorado." Bennett also praised the Colorado Water Plan published by the Colorado Water Conservation Board in 2015. While acknowledging that the plan is "not perfect" and some people find it lacking in details, while others consider it too detailed, Bennett said the plan is a testament to how the state came together over water, "understanding that there is no way we can address this issue if we are at each other's throats." Gov. 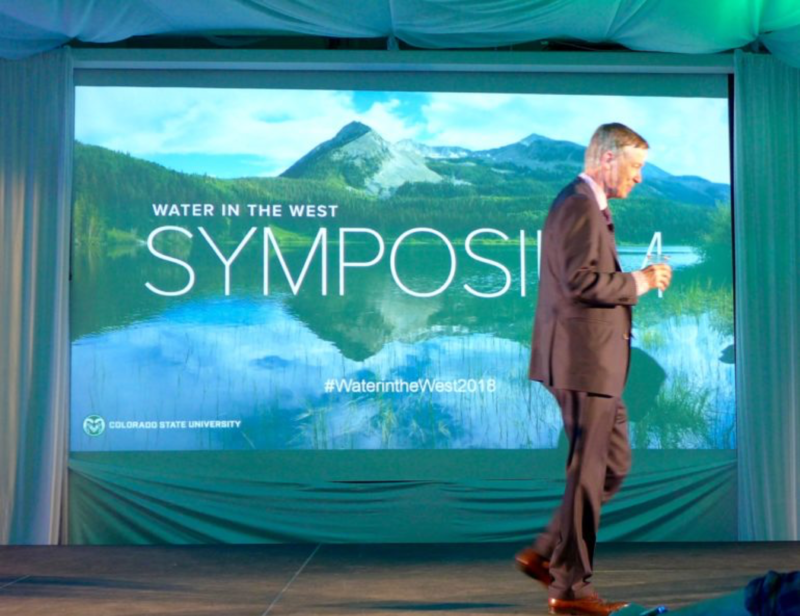 Hickenlooper, who signed the executive order in 2013 calling for a state water plan by 2015, spoke to the symposium Thursday, noting that with 259 days to go, he is now counting the days until his term of office ends. He said the water plan, which weighs 4 pounds and took countless meetings over two years to produce, was referred to in the governor's office during the process as "the colossal exercise." Regardless of what one thinks of the plan itself, the governor's water-planning process did result in a working agreement between water interests on Colorado's Front Range and Western Slope over a future potential new transmountain diversion under the Continental Divide. Senior water mangers from both the Front Range and West Slope praised that agreement, or "conceptual framework," as recently as April 18 at a regional water meeting in Grand Junction. Given this year's low snowpack, Hickenlooper also said Thursday the state was now "drawing up the paperwork" to activate the second stage of the state's drought management plan. Aspen Journalism is an independent nonprofit news organization. See www.aspenjournalism.org for more. EarthTalk - Will skiing become a thing of the past?